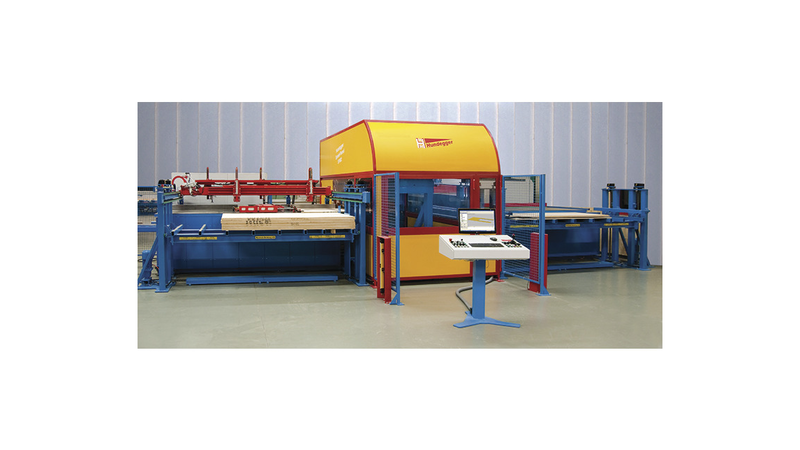 The Speed-Panel Machine is a fully automatic cutting unit for processing all panel materials which are used in the building industry. The plane parts are sawed, milled, drilled and labelled with computer control. Areas of application are, for example, cutting and processing of panelling in timber frame construction, OSB panels in timber construction or linings in the interior fittings etc.The processing is done accurately by means of a circular saw, end mills, drilling units and a labelling unit. Chip extraction is always carried out directly at the processing spot. The panel loading can be effected manually or with the existing vacuum lifter or by means of our fully automatic loading system. The operator can enter cuts and processings directly on the machine computer or the complete data can be transferred from all commercially available drawing programs. The machine program includes a "Nesting" program for waste optimisation.